Yey! Jollibee Foundation finally replied to the e-mail I sent them last week. 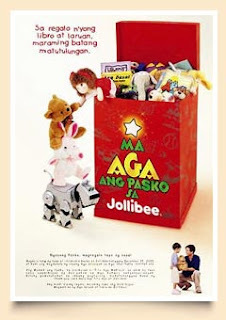 I inquired if they were still accepting volunteers for the Jollibee MaAga ang Pasko Clean-up Activity. Actually, I wasn't aware that there was such activity. I was scanning through the website of Hands on Manila (HOM; of which I am a registered volunteer), looking for updates. There I saw that HOM is a partner of Jollibee Foundation on this endevour. The Cleanup Activity is meant for the cleaning and sorting of all the donated secondhand toys and books received by the different Jollibee branches nationwide. The said event is ongoing until end of December at the Jollibee warehouse at Rockefeller St. in Makati. If anyone is interested in joining me on this, just comment. Thanks!